Our Wandering Palate Melbourne correspondent, Matt Wilson, pigs out, and that’s literally, at his favourite Melbourne restaurant, Scopri. Makes you want to get on plane right away… rustic, hearty food in the Melbourne winter. 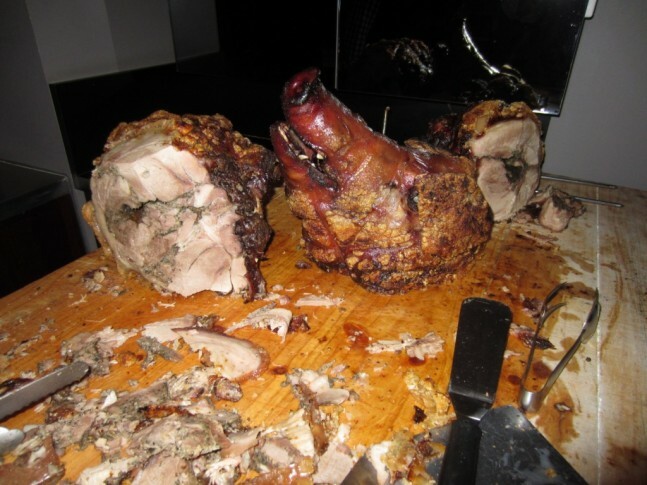 Make sure you scroll down right to the end of the article to see some truly tantalizing pork pictures. There is no meat like that from a pig – a sweet rich crispy indulgence. Next to beef, lamb, duck, turkey and venison – pork is my favourite source of protein. Hey, I am an unashamed meat lover, and so is my fiancé, I suppose that a good reason to get married. Therefore, an evening of slow cooked fanatical fat back is a treat we can’t refuse. Hands down, my favourite restaurant in Melbourne is Scopri – www.scopri.com.au. Owners, Alison and Anthony, passionately run Melbourne’s most authentic Italian restaurant. A young and enthusiastic couple, they epitomise charm and dedication to their devotion. 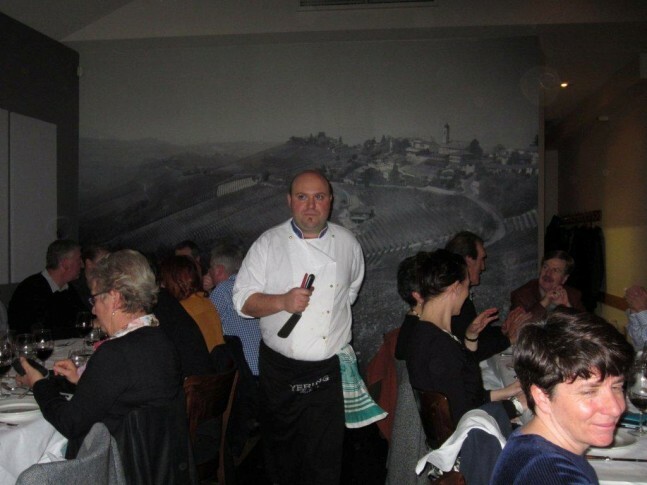 Anthony; an Italian, Alison; a skip, they have together travelled the length and breadth of Italy “discovering” the miscellany and treasure of food and wine – and they bring it back to Melbourne to share it with us with pride and a smile. Scopri truly captures the essence of Italian dining – seasonal ingredients showcasing artisanal producers in a warm, friendly and communal environment. Chef, Salvatore Caccioppoli flawlessly executes in the kitchen – bringing a subtle modern touch to Italy’s traditional dishes. 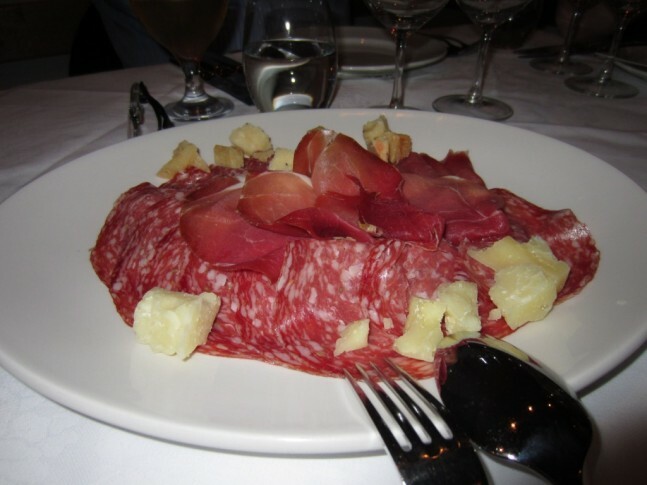 Experience throughout Italy and a Michelin CV, we are fortunate to have Salvatore in Melbourne. The combination of Alison, Anthony and Salvatore is a brilliant hat-trick. Whilst we are regular diner’s at Scopri, this was my first regional dinner, where Alison and Anthony, celebrate the food, wine and culture of one of Italy’s 20 regions. 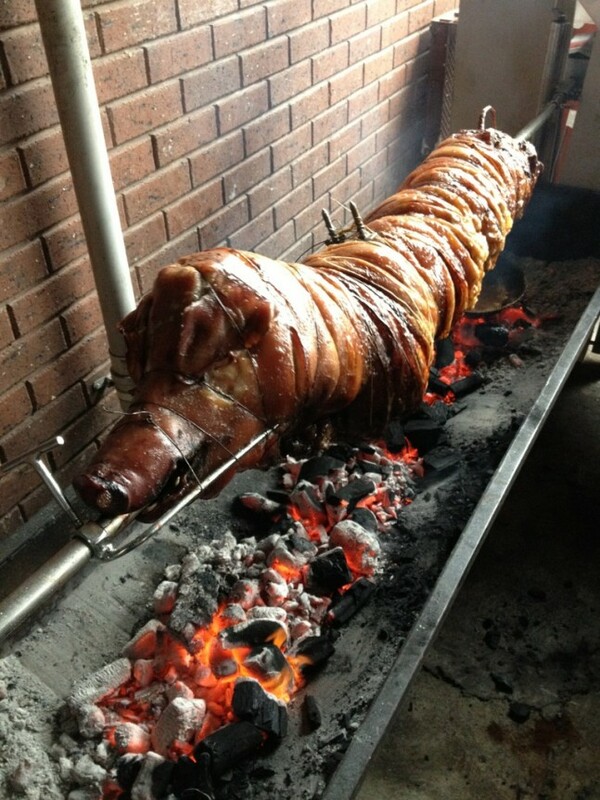 Tonight it was Tuscany and the centre piece Porchetta – a moist, seasoned spit roasted beast of pork heaven. I always start with a stubbie of Menabrea Birra – a crisp lager of full flavour, yeast, maize and hops to stimulate the palate and ready the buds. Antipasto – our pork journey begins in earnest – Affettato Misto alla Toscana – a selection of salumi and formaggio, comprising: Finocchiona (salami with fennel seeds & red wine), Capocollo (cured pork neck), Soppressata (cured pork sausage) and Prosciutto Toscana DOP (cured pork leg) lay tempting on a large communal plater with Pecorino DOP (hard sheep’s milk cheese) and Focaccia al Rosmarino. Salt, fat and spice come together in a seamless lushness. Handmade artisanal delights – fat is flavour. Our first wine is Toscolo Vernaccia di San Gimignano 2010 – pale yellow, light acid with a touch of minerality opens up to reveal citrus then tropical fruits. A nice foil to the abundant pork fat. Vernaccia is one of Italy’s noblest white wines – and as I understand, it was the first Italian wine to be awarded DOC status, in 1966. 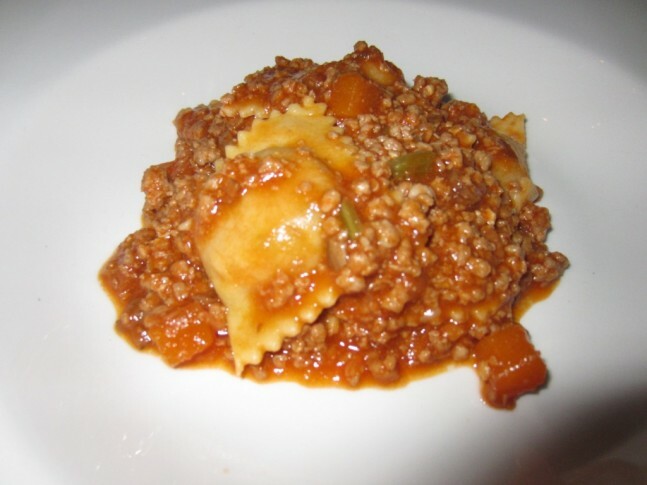 Primo – Tordelli di Patate al Ragu Toscano di Vitello – tordelli are ravioli filled with potato and pancetta, and served with a light veal ragu – typical of the Casentino and Mugello regions in the mountainous East of Tuscany. This is all texture, al dente pasta encases a creamy smooth wow filling. The potato rich, the pancetta salt. An ideal belly coating dish in the midst of a bracing Melbourne winter. Washed down with La Mozza ‘I Perazzi’ Morellino di Scansano 2009 – bright plum, rustic spice and dark fruit, soft tannins, a touch of leather and roast meat, good length and a dry finish. From the Maremma region of Tuscany – 85% Morellino (the local name for Sangiovese), 5% Syrah, 5% Alicante, 2% Colorino, 3% Ciliegiolo – unoaked and exceedingly gluggable. 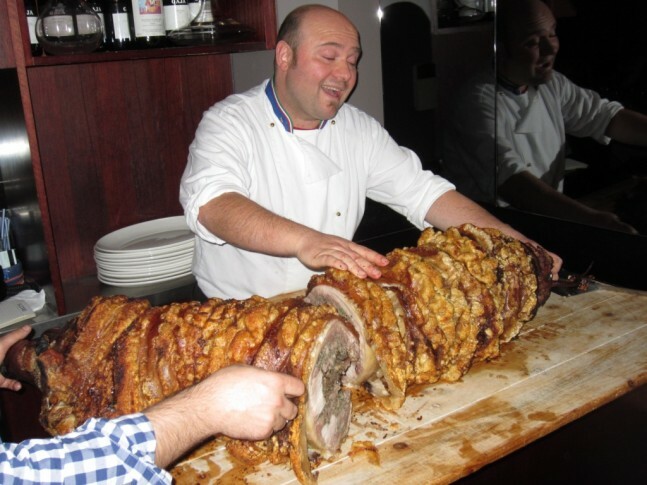 Secondo – now for the beast – Porchetta alla Toscana – press play on Nessun Dorma – close your eyes and savour. 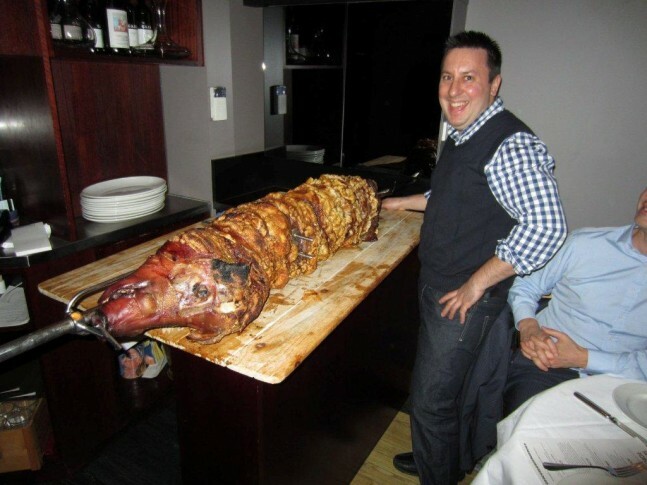 To a rousing applause, Chef Salvatore and Anthony proudly parade in the Porchetta – skewed from nose to tail – upon their shoulder – 65kg of swine is deboned, rolled and cooked slowly on the spit, down to 35kg of rich and succulent pork. 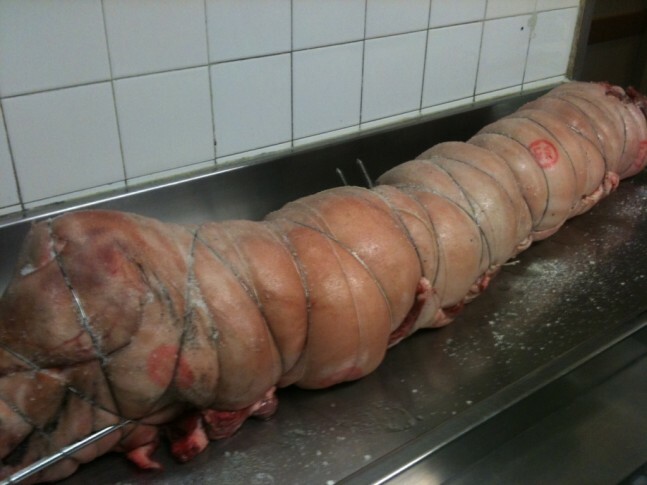 Deboning and rolling forms a uniform cylindrical shape – a pork strudel/ roulade – layers of meat, skin, fat and stuffing blend into a mouth watering explosion of flavour. 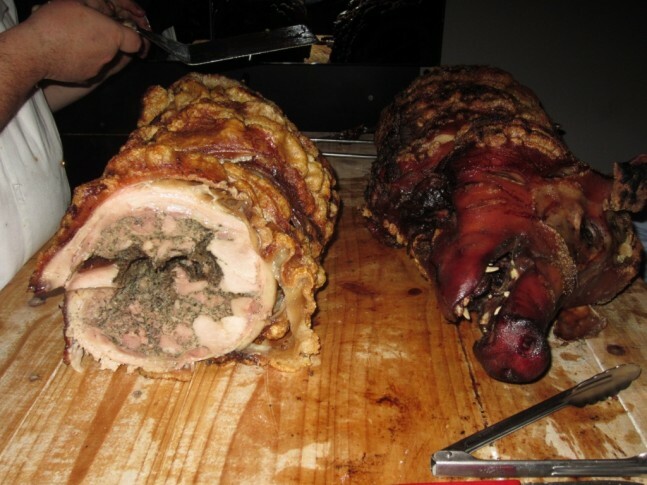 The cavity is seasoned with salt, pepper and herbs (garlic, rosemary and bay leaves). This takes time, fortunately Euro 2012 provides another suitable catalyst to rise early for the days preparation and cooking. 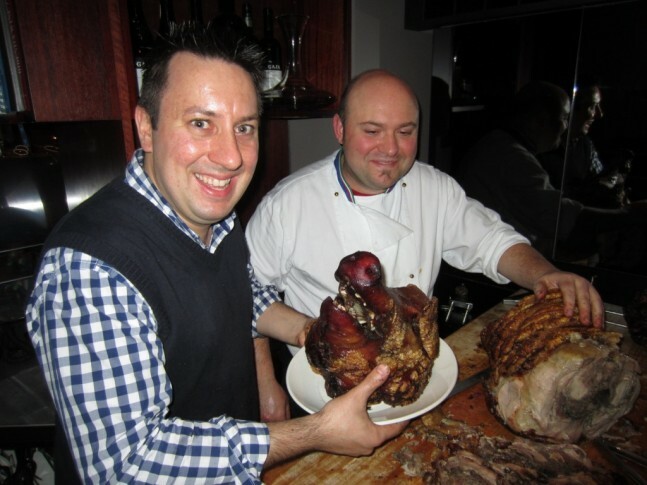 Then even better, Italy beats England 4 -2 in a penalty shoot out – Salvatore and Anthony are primed for the Porchetta. Six hours of cooking, a few more hours of resting and we have a perfect piece of pork. Smiles adorn and tummies we rub; the waiting congregation. 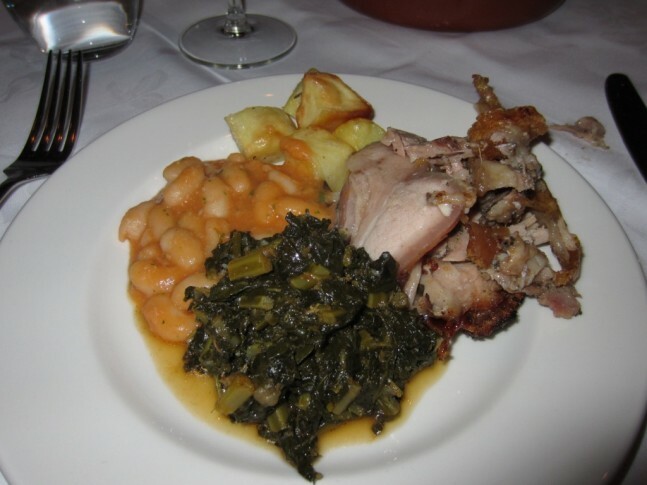 Sliced and served panino (in a roll) with regional side dishes – black cabbage, potatoes and fagiuoli all’uccelletto (white beans “cannellini” in tomato sauce – sooo Tuscan!!). Pork is rich. Pork is texture. Pork is spice. Pork is fat. Pork drips with flavour. To accompany, Castello di Monsanto Chianti Classico 2009 – quintessential Chianti, mostly Sangiovese but perhaps a dash of Canaiolo (once the dominant grape of Chianti) and Colorino – a vivid red spectrum hue, its fleshy, juicy and structured; a tad of chocolate, a lovely long dry finish – age it will, cut through pork fat it does. As full as a family po our table sits and beams comfortably uncomfortably satisfied. 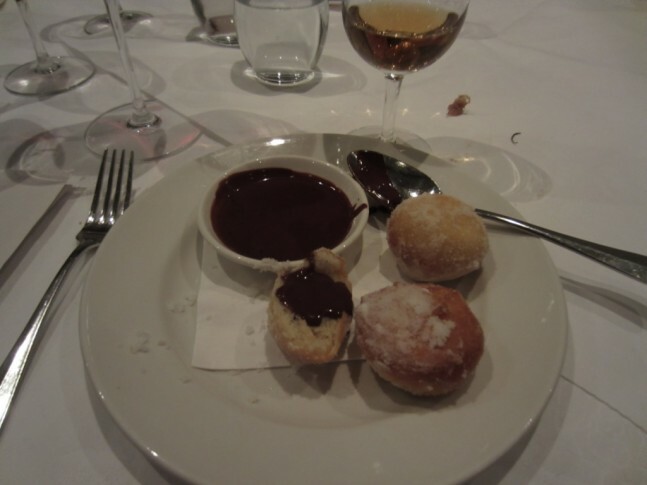 Dolce – Bomboloni Con Salsa Di Cioccolato – little fried dough balls “donuts” with a chocolate dipping sauce. Fluffy morsels of sweetness, perfectly complimented by Guicciardini Strozzi San Gimignano Vin Santo 2005 – a golden ‘straw’ wine or the ‘holy wine’ once used for Communion; Malvasia, Trebbiano and San Colonbano dried and blended to treat the senses – amber robe, apricots and marzipan, some marmalade and bush honey. Padre coffee and reflection – another great evening at Scopri – buonanotte!